In fact, Ginger Milk Curd (薑汁撞奶) is not in my To-Do list but starring at a bottle of milk that is expiring, I asked my family members what do they want to eat using milk as an ingredient. The response (coincidentally or not) I got from my mum and husband was, Ginger Milk Curd (薑汁撞奶). I remember vividly that when we went Hong Kong for a family holiday two years ago, both would order a bowl of 巧手薑汁燉鮮奶 (薑汁燉奶) from Yee Shun Milk Company, a cafe famous for their steamed milk desserts, almost every day as we stayed at the hotel near the cafe. The taste of the steamed ginger milk curd is similar to Soya Bean Curd 豆花, save that it tastes milk than soya and much smoother. 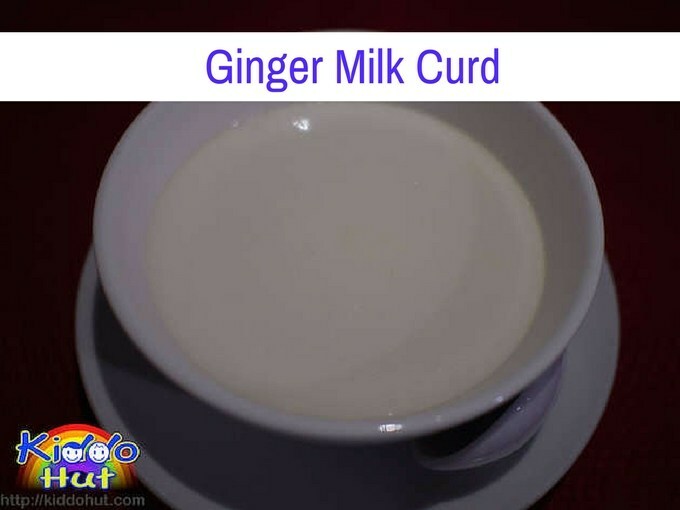 Ginger in the recipe gives the plain milk curd an added aroma. As commonly known, ginger aids in digestion and blood circulation. 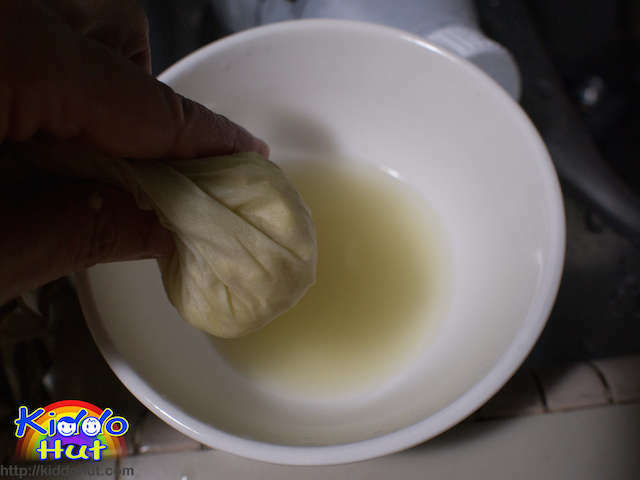 It alleviate nausea and churning stomach. The ginger milk curd which some stalls are selling aren’t as silky soft. And, often or not, I always heard friends telling me that their milk curd didn’t set properly. So, there must be some ingredients that made the difference. After doing some researches, 简易食谱 by Christine shed some light to the secret – Egg White. This is an easy dessert to make. A point to note, after it is steamed, do not remove from the steamer. Let it sits in the steamer for 10 minutes before serving. Despite that, it is still scotching hot so be careful when eating. 1. Cut the ginger in small pieces or grate it. 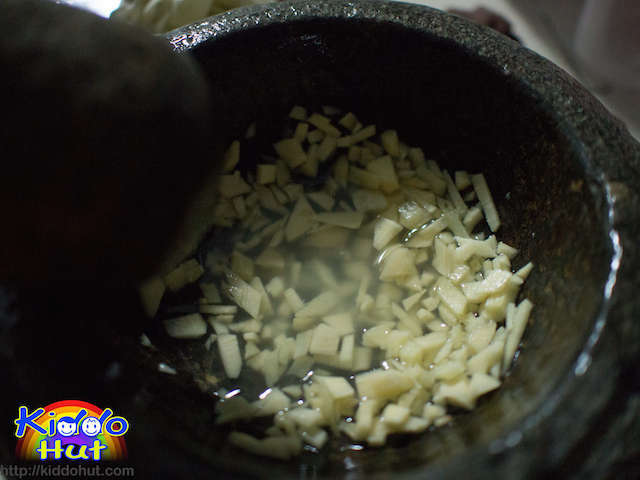 Put the grated ginger and 3 tablespoon of water in the mortar and use the pestle to grind out the juice. Use a cheese cloth to squeeze out the juice. If you do not have a mortar and pestle, you can just use the cheese cloth or hand to squeeze out the juice. Using bare hands can cause a bit of warming effect on your hands after that. The amount of ginger to use depends on your preference of ginger taste in the milk curd. I used 45g of ginger. 2. Put all ingredients in a big bowl and mix well. Do not beat too hard to avoid making too many bubbles. 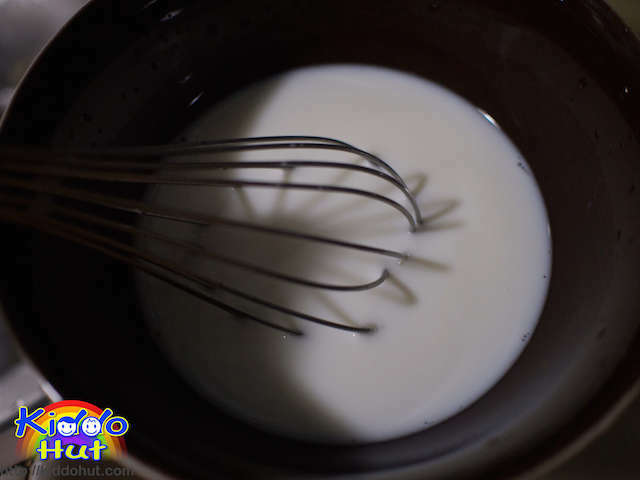 Just use the whisk and mix, to dissolve the sugar and egg whites. 3. Sift the mixture through a fine sieve. 4. 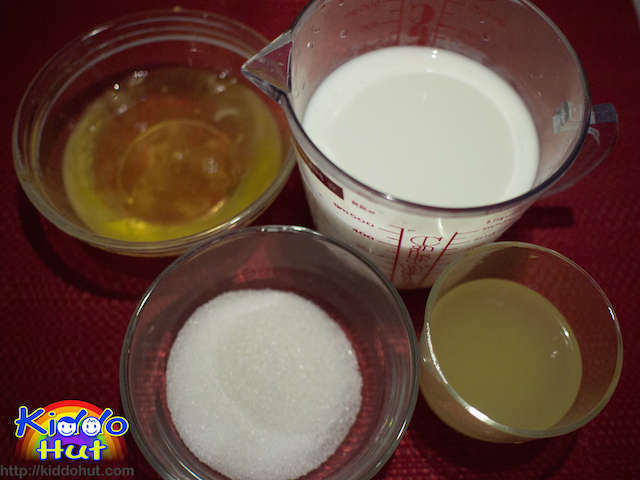 Transfer the milk mixture into two rice bowls. Steam under medium-high heat for 10 minutes. 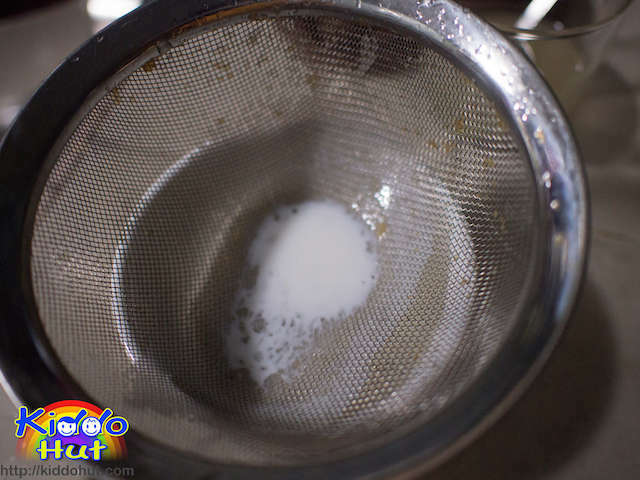 Use a cloth to cover the steamer cover to prevent water from dripping into the milk curd during steaming or lifting of cover later. Alternatively, you can cover the bowls with aluminium foils. 5. After the heat is turned off, do not remove the steamer cover. Let the milk curd sit in the steamer for another 10 minutes. 6. Serve hot. But, be careful as the milk curd is still hot after sitting for 10 minutes. – can it be refrigerated and served cold? – is addition of ginger juice an absolute necessity or can it be omitted? Thanks for visiting Kiddo Hut. Yes, if you prefer it chilled, you should be able to refrigerate although I have never tried it chilled as it is meant to be served warm as ginger has the warming effect to our body. In fact, if you prefer not to add the ginger juice, it will be just steamed milk curd and that’s perfectly fine.